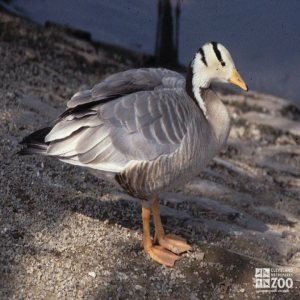 The range of the Bar-Headed Goose is central Asia, Burma, and India. Bar-Headed Geese inhabit marshy lakes and rocky outcrops at high elevations, up to 15,000 feet. Unlike many geese, this Bar-Headed Goose feeds primarily at night or at dusk. It has been domesticated in parts of the Soviet Union and is easily kept in captivity. Incredibly, these geese have been seen flying over Mt. Everest at an altitude of 30,000 feet, where temperatures are well below freezing. Despite a substantially diminished amount of oxygen in such rarified air, Bar-headed Geese have been heard to honk or call during their high-altitude flights. One theory that has been advanced to explain such puzzling behavior suggests that the geese lived in the Himalayan area before the land was uplifted to such heights. Over eons of time the birds adapted. It is theorized that their calls may provide echolocation, giving them a determination of their altitude vis-à-vis the mountain peaks. They forage mainly on land, by grazing; also on water. They are migratory, flying southward to winter in northern India and adjacent countries. Breeding starts in late May or June for the Bar-Headed Goose. They gather in colonies and build a shallow nest of vegetation among marshes, on the ground, or in trees. Chicks have pale grayish-brown down above, and pale yellow below. Fledging is in approximately 53 days.